My friends at Wasa recently reached out to me about creating a recipe that would go well with their line of crispbread crackers. Funnily enough, I actually ate Wasa crackers a lot when I was teaching English in Prague! Considering I couldn’t read the ingredient labels on any of the other cracker-like items at the store, it seemed like a safe bet. I love that they’re super crunchy and only have a few, pronounceable ingredients, too. I was in the mood for a healthy and protein-packed snack, so I decided to try my hand at a fun bruschetta using edamame (soy beans), which we randomly have mass quantities of in the freezer right now. I think Matt and I both keep buying it, thinking we’re out… and now we have a fridge full of frozen edamame. I’m okay with that, especially when it makes things as delicious as this bruschetta! This simple bruschetta makes a great healthy and protein-packed snack or party appetizer. Place all ingredients in a food processor and whirl away! Once the ingredients are processed somewhat evenly, your bruschetta is ready to go. 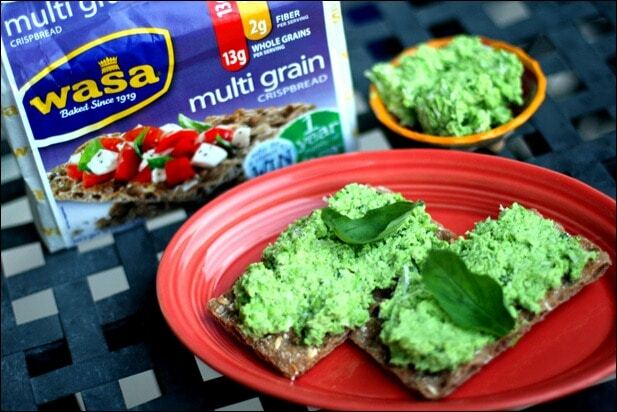 Serve atop Wasa crispbread for crunchy deliciousness and enjoy! Easy enough, right? Give it a try! This would be a fun snack during the workday, too – just pack the bruschetta mixture and the crispbread in separate ziplock bags, then assemble when you’re ready to eat! That way nothing gets soggy. In the spirit of recipe creation, Wasa also offered to provide a $25 Gift Card and two boxes of Wasa Crispbread to one of you guys! To enter to win, simply leave a comment on this post saying what you would create to eat with the crispbread! Win an extra entry by tweeting a link to this contest, including my Twitter handle (@fANNEtasticfood) in the tweet – just be sure to come back and leave another comment saying you tweeted! U.S. residents only, please – I’ll draw a winner when I’m back from Florida on Monday. I enjoy Wasa crackers with tomato jam and a bit of cheese (pecorino is good). I’d create wasa pb & J–a low carb version of the classic! I think those crackers combined with a little cheese would make the perfect pre-workout fuel! I was top the crackers with some hummus or cheese! I would eat them with some hummus! I’d eat them with hummus. I have some homemade curried coconut cashew butter that I got as a holiday gift. I think it would taste great on a Wasa . I love wasa and hummus! This looks soooo good!!! I’d create a similar spread but with a tomato and roasted red pepper base. Yum!! definitely making this spread. sounds great! My girls and I love to make homemade cheese dip. It goes well with Wasa! I’d like to take the multigrain crispbread and top it with light cream cheese and black olives. I usually just pair it with cottage cheese, but a spicy hummus might do the trick as well! That sounds delicious. I’d eat them with hummus probably. Are they crunchy like crackers? I’d probably also want to crush them up and use them as a breading on chicken. I’m not very creative in the kitchen – which is why I love your blog! I’d probably start with this, or if I was feeling super lazy, hummus. Yum! I’d probably make a traditional tomato and mozzarella bruschetta. I love plain wasa but I also like to top it with hummus or some laughing cow cheese. i’d eat them with hummus! I’m intrigued by the idea of making an almond-honey-low fat ricotta spread for these — would have to tinker with the proportions, though, since I’m not usually a sweets maker. Maybe with some cinnamon? Ironically, I’m also from the DC area and soon to be headed to Florida. For NYE i made your gauc-hummus (Spinach & Avocado Cannellini Bean Hummus) and i bet it would be delicious with these Wasa crackers! Literally was eating wasa at my desk as I started reading this. I love these crackers for when I needa little carb to fill me up ! Adding edamame to my grocery list now! I’d pair them with a little goat cheese and a roasted/marinated red pepper! YUM! that recipe looks amazing! would love to try it. I’d try them with my homemade Sun Dried Tomato Hummus! 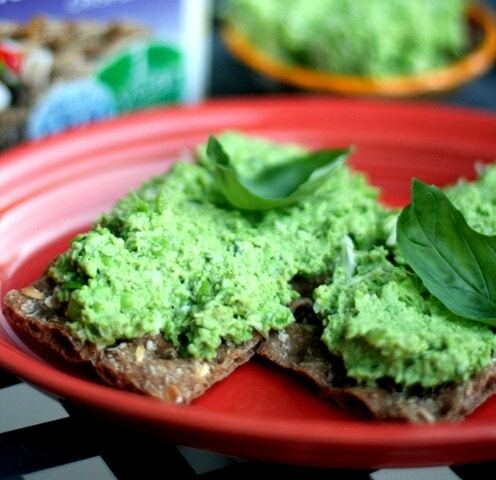 I would make this Edamame Bruschetta…looks delish! I have no idea!! I’ve never had the crackers before, and would love to try them. Also, I have a bag of edamame in the freezer that I had no idea what to do with. Thanks! Oh Gosh…When I was in Prague I lived on those really thin pretzel sticks….offen dipped in peanut butter or nutella. I love Wasa with a vinegar/lemon based tuna salad or egg salad. That crunchiness is perfect! Mmm – the bruschetta looks so good! 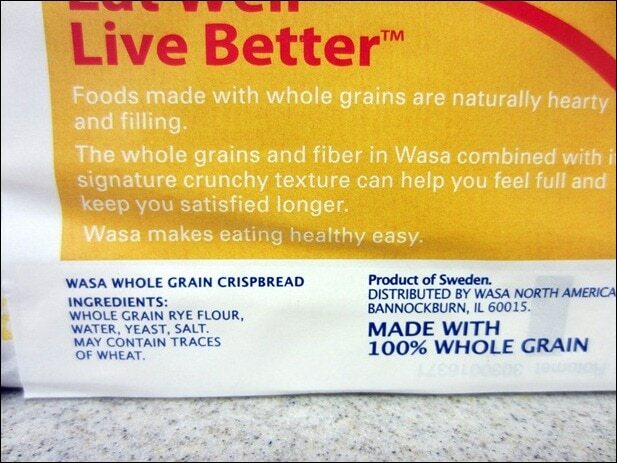 I’d probably make some guacamole to go with the Wasa crips – yumm! I would eat it with hummus! I LOVE Wasa crisps! They are especially good with peanut butter, cinnnamon, and banana or tuna salad with avocado or mango slices. I would top the crispbreads with cream cheese and smoked salmon! I would pair them with Brie or some other cheese and fruit! I’m obsessed with cheese plates right now! I love their crackers! I mostly eat them with cheese or hummus. If I won I’d create something with pulled pork- I made POUNDS of it last night, and now the freezer is full! I łike eating it pain. That was supposed to say plain. I love Wasa! Wtth PB or a laughing cow cheese are my fav. I used to eat the sesame variety with a schmear of peanut butter. Delish! Now, I’m thinking of adding some thinkly sliced apple to that combo or apple and cheese. I’m totally into apple and cheese together currently. That WASA bread looks delicious! I would love to eat it with a roasted red pepper white bean dip! I would try it with hummus. I definitely want to try it with this edamame dip! I am going to make this for my sister’s wedding shower! wasa is a great vehicle when you’re pretending you’re too good to go after whatever dip/spread with a spoon. hello peanut butter. I would try your recipe with the Wasa. I would make your pumpkin bean dip! So delish! I would try it with moz and tomato! Tweeted! Where are you in FL, btw? Tampa?! Haha no we’ll be in Titusville! Other coast, wah. Not going to lie, even though this is my 5th school year in FL, I had to google map Titusville…#floridafail aha. Have lots of fun at the wedding!! Haha yeah I forget how big Florida is! I would make a pesto with frozen peas, Parmesan, garlic and olive oil. Yum! I would probably make some kind of yummy egg salad and put it on top. This bruchetta looks amazing! I can’t wait to try it out. I would create a salty sweet dessert cracker with fat free cream cheese & dark chocolate with sea salt melted ontop! 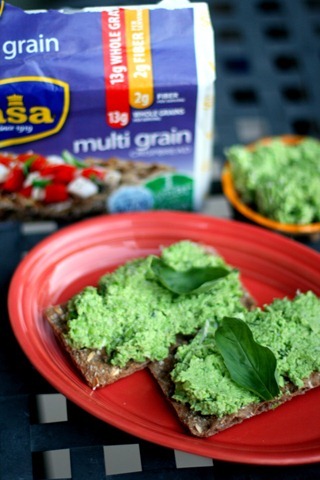 I think Wasa with hummus or laughing cow for something easy and quick- they would also taste good with any variety of bruschetta or an olive tapenade! I also like the idea of a little tomato sauce and mozarella for mini pizza bites! YUMMM! I’d love Wasa crackers with homemade guac, or my usual thinly sliced turkey and spicy mustard! I love making edamame hummus but never thought to do a bruschetta. Love the idea! I love wasa with a thin layer of hummus topped with tabouli! So good as an afternoon snack. I took them for lunch with cheese or hummus–just right! I would make mini Wasa pizzas. I think I would try peanut butter. I’m craving some egg salad so maybe that with the crackers! I would probably make some kind of spicy hummus since I never get sick of hummus. Thanks for the giveaway! I’d top them with fresh mozzarella, tapenade, and cherry tomatoes! I would definitely use them to try out your edamame bruschetta – we also have tons of frozen edamame in the freezer and the recipe sounds delicious! I like Wasa crackers with jalapeno pepper jelly & cream cheese! i’d layer pb, pumpkin, and banana! I would like to create a PB&J with banana! I think I would go simple and add hummus and cucumbers on mine! I would top them with laughing cow cheese and jam! I would eat them either as a dessert with peanut butter and drizzled melted dark chocolate or as a healthy snack with hummus! i would make a pb & j with banana on these crispbreads! sounds delicious! Wasa’s are great! I usually top with a little sauce and cheese for a mini pizza bite snack! I love wasas with pbj! Would love to try with cheese and apples! Cheese and jam snack crackers! I love them with goat cheese. Simple and delicious! I bet Wasa would be good topped with sliced fresh fruit (like strawberries) or mashed berries and drizzled with a little melted coconut butter! Lox and cream cheese on top sounds like it would be delicious. I love to crumble them and sprinkle on oatmeal for an added crunch. I also sometime put pears dusted with cinnamon on them. unfortunately, I’m not a creator of recipes, I’m a recipe follower! I’d love to put some laughing cow on these though and have them with grapes and wine! I love wasa crackers and usually use them to scoop hummus or top with tuna salad. I am all about using them in place of bread. I really like them topped with chicken salad. I also like to mix tuna with hummus and then season it. I will also cut them in half and serve them with laughing cow and bruschetta. Bet it would be good with an avocado egg salad on top! I’d eat it with pb, cocoa, and banana! I’d make Wasa bruschetta toasts! I would have it with chicken salad made with Greek yogurt instead of mayo. Your recipe sounds great! honey goat cheese + fig butter.. delish! holy cow that sounds yummy!! A little pb&j — a twist on the sandwich! I usually buy Wasa crackers and make PB & J, but I could see using them to make mini-pizzas (just microwaving for a few seconds to melt the cheese) or topping with Nutella & banana slices! i love plain tofu, and i think it’d go really well with slightly sweet and juicy tomato, so i’d try to concoct some kind of spread with those ingredients. wasa cracker on the bottom and maybe some green onions and pepper on top! That would also be great as a dip for crudites!! I have a huge bag of frozen soy beans in my freezer too, definitely going to make this! I love Wasa crackers and usual have them with skinny cow cheese, I must try this now too! A melty cheese crispbread sounds like an awesome afternoon snack at work!! I’ve heard great things about topping Wasa crackers with laughing cow cheese and strawberries! Homemade hummus! Would have to try your recipe too, it sounds great! I would top the crackers with feta cheese, olives, and cucumbers for a Greek-inspired snack! These sound so good! I think I’d top with goat cheese and a little homemade cranberry sauce. Keepin’ the holidays alive all year round! 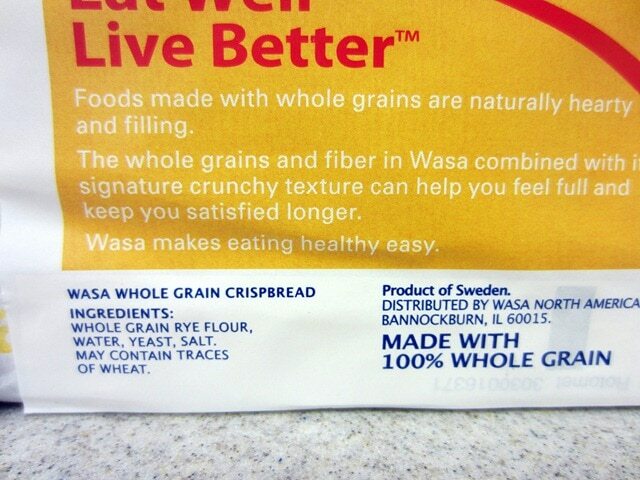 I have family in Sweden so I used to eat Wasa a lot in Europe too! I like to put cheese and avocado on it. I’d definitely pair it with some kind of cheese! Topping them with almond butter and banana slices sounds delicious. 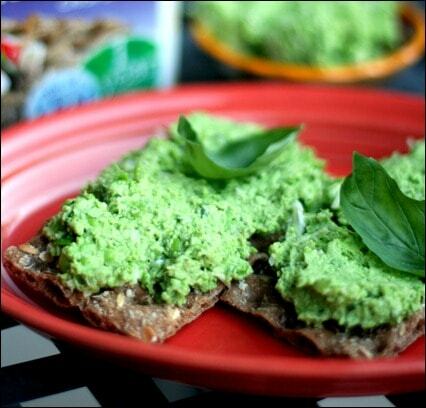 These would be perfect for a white bean and pesto dip that I make. I’d top them with apricot preserves and melted brie. I am a cheese and cracker girl although I do have a spicy white bean dip recipe which I ame sure would be great on these. What a great recipe! I like to eat them with cheese or almond butter. Yum! There is always a box of Wasa crackers in my pantry, and edamame are always in my freezer. I think that means that I’m destined to make this recipe. It looks like the perfect afternoon snack. If salted Edamame pods taste good already, i’m sure this one tastes even better. Can’t wait to try it to see if better is an understatement. Thanks Anne! Will toasted baguette also taste good with this? This edamame dip is really tasty – wow, what a winner! so that made it super easy!) Seriously, I’d shell the soy beans for this, it’s so good! Bought three packages of multigrain WASA on sale, too – delicious with the edaname dip! !